SENATOR Pauline Hanson says she will go to the British Home Office to prove she is not a dual citizen. On Tuesday Senator Hanson said she could "assure everyone" she was not a British citizen, but on Wednesday she changed her tune slightly and promised to contact the British Home Office for clarification. Senator Hanson reportedly told Woman's Day magazine in February 2010 she was relocating to Britain where she could hold dual citizenship. While the senator admitted on Tuesday she had not officially checked her ­status, she maintained she held only Australian citizenship as both of her parents were born in the country, with her grandparents born overseas. "It has been raised with me that possibly I should go to the Home Office," she said. "If the laws actually state that if your parents were born in England then I could be under that. I am not under that, my parents were not born in England so therefore I am not entitled to a British citizenship. "If it would make everyone happy and I've got no problems about it, I will actually make inquiries." Ms Hanson said she suspected the sudden speculation had been raised by rival Queensland Labor senators. "I know you're all worried about me losing my seat in the Senate, I am not going anywhere," she said. The curveball threatened to derail her state election campaign, while also ­facing questions over the ­whereabouts of state leader Steve Dickson. However, Senator Hanson strongly declared she was the leader of the party and that Mr Dickson would take her role next week while she fulfilled her duties in the Senate. 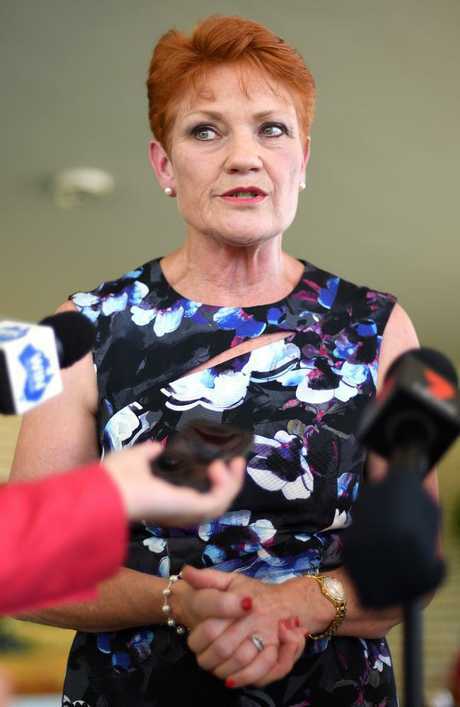 With Mr Dickson making a cameo appearance on day one of the campaign, Senator Hanson said that his first priority was ­winning his own seat of Buderim. Polls show the LNP vote had increased since his defection to One Nation. "I am the national president, I am the Senator for Queensland and I take the message back to Steve and, when I am in Parliament next week, Steve will be out here again," she said. "It's no different when you have Bill Shorten or Malcolm Turnbull who are out here campaigning for their own party. "I am the face of the party, people do recognise me and I am also a senator. "I think I am getting behind my candidates; of course I should be supporting them and being on the road with them. Steve will take up that lead role when I am in Parliament next week."